It feels so good to be back. I had a lovely week off, despite the sweltering heat and I'm ready to get back to the grind. I can't believe how much I missed blogging and interacting with my blogger friends - I missed you guys loads. Today, I'm going to share with you a meal thats so quick to put together, it never ceases to amaze me. The added bonus, is that you need nothing special for this pasta dish. All the ingredients are usually found in any pantry most of the times. I don't know about you, but so often I find myself so hard pressed for time that I haven't been able to put together something for dinner. I'm trying to increase my repertoire of quick and easy meals that I can use on days like this rather than ordering for take out. I somehow just can't do takeout anymore, unless of course there is no other option. This is one of those meals that I stumbled upon in those times of desperation and I'm so glad I did. This ones a keeper. How do I know that? I'm going to share with you a piece of information I don't think I've mentioned before. My husband does not like pasta. And thats that. This is difficult for me to understand, because me, I love pasta. Imagine my joy when he told me he really enjoyed it. I tell you, this ones good enough to convert even a non pasta lover (if there is such a thing). Go ahead and give this a try. While the pasta is cooking, heat some olive in a pan. Add the onion and stir fry for a couple of minutes, till it starts softening. Add the chopped garlic and let it release its flavors. Add the diced peppers and stir well. Let it cook off for a couple of minutes. Season this mix with salt, crushed black pepper and red chilly flakes. Mix well. Taste and adjust the seasoning if needed. 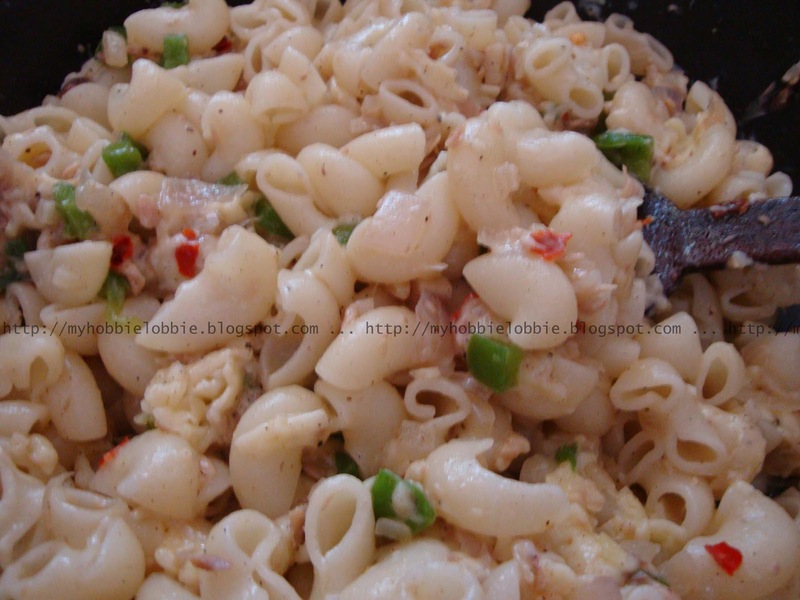 Add the cooked pasta to this mix and gently fold everything till all the ingredients are evenly distributed. Add some grated cheese. I don't use a measure for the cheese, I just grate as much as needed. I taste to check if theres enough to match our liking. Again, mix gently, you don't want to break up the pasta. The heat from the cooked pasta as well as the fish mix will melt the cheese, making it even better. Spicy tuna pasta looks awesome delicious. Juliana its always a pleasure to have to stop by .. have a good week u'rself! Thanks Gloria, Christy and Juliana!! !